The rule regarding double hits that Tiger was almost penalized for at the Hero World Challenge this month will change in 2019. It's safe to say that Tiger Woods is not happy with the way his second round ended Friday at the Hero World Challenge. After all, he made a double bogey at 18. But it could've been much worse. He was nearly penalized for a bizarre second shot from under a bush off the 18th fairway. Woods took the shot from one knee with a limited backswing. Here's the part that's even more odd: Woods did indeed double hit the shot, but he was not penalized because HD slo-mo video replay was required to detect the violation. Woods was cruising on Friday afternoon, having made five birdies over his first 17 holes to get to four under, just four shots off the lead at the time. It was a nice turnaround from his opening 73 on Thursday that featured a devastating triple bogey on the par-3 12th. At 18, Woods hit a fairway wood off the tee to avoid the water that runs the length of the hole. His tee shot sailed right, landing in a sandy waste area. 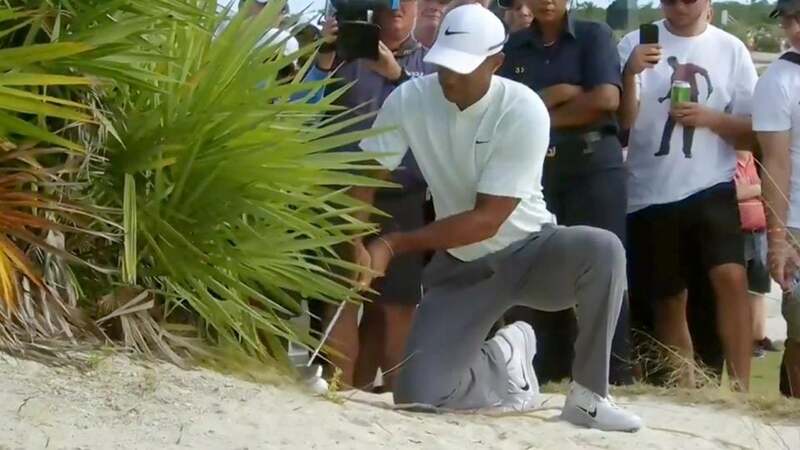 Tiger arrived at the spot only to find that his ball had nestled itself underneath a leafy, Bahamian bush. That's where the controversy began. After talking to a rules official, Woods got onto one knee and took an awkward swipe at his ball. He made contact and his ball rolled out to a decent spot in the rough. After finishing off his double-bogey 6, Tiger was greeted by rules officials in the scoring tent to review that second shot. Watch it for yourself here: https://twitter.com/PGATOUR/status/1068602953462775808 As Woods met with officials, social media lit up with speculation that Tiger had either double-hit the shot or scooped it from under the bush: both would result in a penalty. According to current Rule 14-4, if a player hits the ball more than once during a single stroke, it results in a one-stroke penalty. Coincidentally, the new and improved Rules of Golf will wipe out with that rule. But they don't begin until Jan. 1. In addition, Rule 14-1a, "Fairly Striking the Ball" states that when making a stroke "the ball must be fairly struck at with the head of the club and must not be pushed, scraped or spooned." After a lengthy review, the officials reportedly determined that Tiger hadprobably committed a double hit. However, because they needed slo-mo HD video to see it, Woods was not assessed a penalty. Woods can thank newly enacted Decision 34-3/10 for that. According to that decision, "a player's reasonable judgment in making certain types of fact determinations will be accepted even if, after the player has made a stroke, video evidence shows that the player’s judgment might have been wrong, and video evidence that shows facts that could not reasonably have been seen with the ‘naked eye’ will be disregarded." After his round, Woods admitted that the video review showed him hitting the ball twice, but because it wasn't "discernible to the naked eye" he received no penalty. Mark Russell, PGA Tour Vice President of Rules and Competitions had this to say after the round: "Well, Tiger was under a bush and we did determine that he did make a stroke at it. He didn't scrape or spoon or push the ball. And when he did that, Tiger said that he did not think he hit the ball twice. Looking at it in the regular speed on a high-definition television, you couldn't tell that at all, but when you slowed it down to ultraslow motion high-definition television,you could see where the club [sic] did stay on the clubface quite a bit of time and it looked like he might have hit it twice, but there's no way he could tell that." "In this age of high-definition slow motion television, we've got a decision at 34-3/10, Limitations on Use of Video Evidence. Basically it says if the player did not know that he did that and the only way you can tell that is by using this type of slow motion technology, he's exempt from the rules, so there's no penalty there." This is not the first time Woods has been caught up in a rules controversy, so it's likely we'll hear more about this ruling, and the upcoming rulebook changes, for weeks to come.